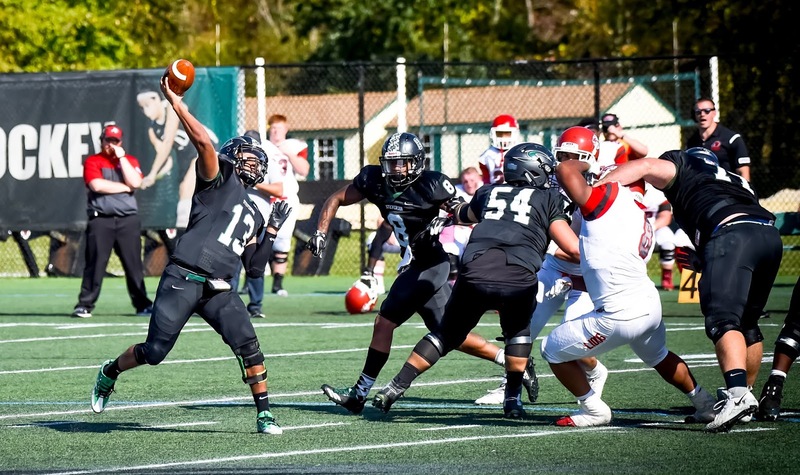 NORTHBROOK, Ill. – Stevenson University football senior quarterback Dan Williams is one of 169 nominees for the 2018 Allstate/American Football Coaches Association (AFCA) Good Works Team. The Allstate AFCA Good Works Team has been one of the most esteemed honors in college football for more than 25 years. The student-athletes who are nominated for this award not only demonstrate a unique dedication to community service and desire to make a positive impact on the lives around them, but they also show tremendous perseverance as well as the ability to overcome personal struggles and come out victorious against all odds. The Allstate AFCA Good Works Team is comprised of 11 players from the NCAA Football Bowl Subdivision and 11 players from the NCAA Football Championship Subdivision, Divisions II, III and the NAIA and one honorary head coach. To be in consideration by Allstate and the AFCA for a nomination, each player must be actively involved with a charitable organization or service group while maintaining a strong academic standing. The final roster of 22 award recipients and honorary head coach will be unveiled in September. 2018 Allstate AFCA Good Works Team selection panel members include: two-time national champion and Heisman Trophy winner Tim Tebow (Florida, 2009 team), former Good Works Team members Zaid Abdul-Aleem (Duke, 1994 team), Matt Stinchcomb (Georgia, 1997, 1998 teams), Brian Brenberg (St. Thomas, 2001 team), Mike Proman (Amherst, 2002 team) and Wes Counts (Middle Tennessee State, 1999 team); media members Kirk Herbstreit (ESPN), Blair Kerkhoff (Kansas City Star) and Paul Myerberg (USA TODAY); Georgetown College head coach Bill Cronin; 2001 AFCA President, current athletic director at Virginia Union University Joe Taylor and David Prendergast, president of the Eastern Territory for Allstate. Williams, a two-year team captain for the Mustangs, is a weekly volunteer at Baltimore's Mount Washington Children's Hospital and has participated in the Mustangs' annual spring reading program at Mechanicsville Elementary School in Sykesville, Md. He has served as a volunteer with Carroll County Special Olympics and worked as a football instructor for Special Olympics as he attended the 2017 NCAA Convention in Nashville, Tenn.
On campus, Williams is a team representative to the Stevenson Student-Athlete Advisory Committee (SAAC) and helped develop marketing for last year's "Inside The Stable" video series. He is also the vice president for Stevenson's chapter of Fellowship of Christian Athletes (FCA). On the field, Williams is a two-time Middle Atlantic Conference First Team selection and the 2016 MAC Offensive Player of the Year and a 2016 D3football.com All-Region selection. He is the program record holder in every passing category and enters his senior season with 55 touchdowns and 6,026 passing yards. Williams has started every game under center over the past two seasons. The Stevenson football team opens its 2018 season at home Thursday, August 30 when it hosts No. 8 Frostburg State in a 7:00 game at Mustang Stadium.